"The Madonna Lily is a symbol of purity, and became known as the Madonna Lily, the white ones being associated with the Holy Virgin by Christians. 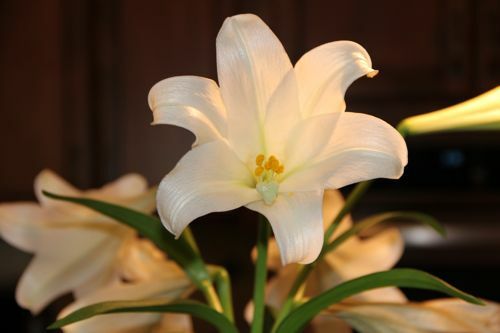 Christians believe that the lily had been yellow until the Virgin Mary picked it up. Lilies are a symbol of fertility. Dreaming of lilies in spring signifies marriage, happiness and prosperity..."
After taking two tests and seeing a very, very, faint second line (the first just before decorating a Nesting Doll Birthday Cake - wasn't that appropriate?!? - on Tuesday of Holy Week and the second on Wednesday morning just before celebrating a birthday), my friend Jamie (our contractor's wife) showed up with a digital test on Holy Thursday. Yep... That one definitely says "Pregnant!" A snapshot of one of the online due date calculators I used to see when I might be due. . .
the doctors office confirmed this when I scheduled my appointment. My Aunt saying that she already knew when I told her last Sunday. . . She said she could tell from my voice the last time I spoke with her, on Palm Sunday, and that when she hung up the phone she turned to her girlfriend and said "She's pregnant!" I didn't even take the very first test until a couple days later! Snuggles (after finding out about the baby) asked "Mommy, is the baby in your tummy a girl or a boy?" After I replied that I didn't know yet, he proceeded to put his little mouth right next to my tummy and yell at the top of his lungs "ARE YOU A GIRL OR A BOY????" Our children's excitement as we told them, on Easter Sunday, of the precious Christmas gift that is already on her/his way! and dimples mark my ears. Please remember us in your prayers!!! Thank you Amy! I wondered if any one would notice that little hint! ;) When I realized the day before her birthday that next April I would have a 3-4 month old, I picked up the phone and started calling her friends!! lol! Oh Jessica - congratulations and God bless you and your sweet baby. already been with us in the rosary prayers ! We love your family and all you are for us -even if we live on the other side of the world,we are so close in hearts and prayers. Congratulations! I'm sure your kids are thrilled!! Last year, we hid little baby figures in our children's Easter baskets telling them we were expecting. Easter is such a beautiful feast to rejoice in new life! How funny that she already knew about the baby. I've had that happen to me as well - my mom says she knew, or had a dream. And, I just now remembered, our kids started praying for the "baby in mom's tummy" the week we conceived!! Lol! Our prayers for you and baby as you anticipate the arrival of another gift! really??? That is so wonderful!!!! much prayers. Oh congratulations. What wonderful news. Looking at your Easter picture I was wondering if it was time for the next one! Congratulations! your new rose is in our prayers. Wow!! Congratulations. What a wonderful Christmas blessing. I'm so happy for you. I hope you're feeling ok? Much love. Congratulations! You will definitely be remembered in our prayers. We love following your blog and have been delighted by how creative you are with your children! Thanks for the all the inspiring ideas! Congratulations! That's such exciting news. I also picked up on your little hint but then I thought it might just be crazy pregnancy hormones making me think that. Maybe my brain isn't totally fried at this point. Lol! Congratulations! Like you I had a Christmas baby, she will be a year this December (28th). I thought something was up when you said you have been feeling very tired!! I will continue my prayers for you and your newest little one. Sending you love and hugs. God bless you and your littest one, and all your family! What wonderful Easter news, and of course that's perfect 9-month timing! Congratulations! Oh, Congratulations!!!!! God bless you and baby!!!!! Congratulations!! We will be praying for you and baby!! Congratulations! What wonderful Easter news! Oh, I also wondered as I read your earlier posts -- Congratulations! Congratulations! What a wonderful way to announce your news! So happy for you all - congratulations! You'll be in my prayers. Congratulations! That is so wonderful!!! Oh Congratulations! What a wonderful Christmas present to look forward to! Congrats Jessica! We will keep you in our prayers! definitely keep you close in prayer! Congratulations, Jessica! What wonderful news! You and baby will be in my prayers. Congratulations! I knew when you mentioned in a post a few days ago that you've been very tired lately, an announcement was coming. So you're going to go from having no December birthdays in your family to two! I wish you an easy pregnancy and delivery! Congratulations!! I'm so happy for you and your family. Congratulations, Jessica!!! Yes, I too, smiled at the comment about next year's party... :) If you can spare a prayer, please send one up to whatever attentive saint intervenes on your behalf to have so many babies sent your way! I have three girls, but as I am getting older, I am starting to get a little anxious about those blank windows in all my recent pregnancy tests! :( God bless you and your little one. We'll keep you in our prayers! YAY! Congrats! So excited to read the news! Another Christmas baby, how special. Congratulations!!! I am sooo very happy for you!! Take good care of you and I will keep you in my prayers! Every good wish, my dear - I also had wondered, when you mentioned being tired... Happy news indeed. Good health to you and your precious burthen. - Valerie, NZ. Congratulations! Best thing I've seen online today. Many prayers for a smooth, trouble free pregnancy. God is good. It sounds like some of you know me pretty well! It still surprises me though, that my Aunt was able to tell before I did. (I wasn't even late yet! Though I did know that there could be a possibility...) It's been hard to keep it a "secret" (at least online), and I planned to wait until after seeing my midwife to say anything, but I figure now you can all keep us in your prayers! Lenetta and J.C. ~ I will say a prayer for both of you! I am so happy for you! Congratulations, although I must say in your May 2nd post you mentioned you were feeling quite tired and I honestly was wondering if you were pregnant. I enjoy reading your blog so much, and you are such an inspiration to me and a wonderful model of the type of Catholic mother I hope to be someday (I just finished earning my masters). Congratulations again and please take care. Congratulations! You news made me smile. And even though I am holding a 6 wk old little boy in my arms right now, your news makes me excited for the next time I see 2 pink lines. God Bless you and your family. Congratulations, Kelly!!! I can't believe we have the same due date!!! How exciting!! What a JOY to be your 6oth comment! May you get at least 60 more:-) This beats the secular culture on the outside...Hallelujah! As I mentioned on FB, our prayers will be with you. Showers of grace are already falling upon you for a blessed Mother's day! I had a feeling you were! When you mentioned how tired you've been. ;) Congratulations! We'll be praying for you! God bless! Many congrats to you and your family. Will include you and your wee one in our prayers. Many blessings to you! Okay, I'm not going to read all the the comments (there's 63!) so I hope you forgive me if I'm redundant...but then again, who cares if I'm redundant?! Congratulations, Jessica. Congratulations, Jessica's husband & family. We are THRILLED for all of you. Baby #9!!!!! I am so excited for you, Jess! Congratulations!!! Congratulations!!! I announced our pregnancy on pretty, happy, funny, real also!! I am due in October. Sooo happy for all of you! Will keep you in my prayers. When you said "too tired" in a recent post, I wondered. . . Congratulations! How WONDEFUL Jessica! We are all so happy for your precious family! The girls all squealed when I told them. Buck immediately said what is it... a Boy or Girl? Isn't that funny? Congratulations! A Christmas baby is always special! I am a nonCatholic,nonhomeschooling,nonyoung mom who thoroughly enjoys your blog. I was thinking that it was time for another! Praying for all to go well for you. I have been wishing hoping and praying for just such news. I just felt with my whole being that it would be so wonderful if it were true and here comes another perfect gift from heaven. Oh praise God praise God I'm so happy I could sing. Prayers are coming your way for every grace that will make this pregnancy perfect and wonderful. God has blessed this child in choosing you as mommy. My heart is melting in gratitde. God keep smiling upon you dear one! congratulations!!! This is kind of random but when I saw the cake with the nesting dolls I admired them and then all afternoon I had this nagging feeling like I should write and tell you to be really careful about eating dyes while you are pregrnant. Then it occurred to me that I had no reason to believe that you were pregnant and didn't actually write because you are obviously in charge. Since reading your post today my memory was jogged about that feeling I had about the artificial dyes and pregnancy. I decided that I will just fell better leaving a comment that I don't even claim to understand however random then letting grace slip by just in case it is grace. I decided it is ok for someone I've never met to think me nuts but God sometimes works in ways we don't even understand so I'll just go out on a limb just in case it will at the very least make you feel loved. Best of best wishes to you and many supprtive prayers for your whole beautiful family and especially this precious new addition. I'm happy beyond words for yoy! I've never been told to be careful with dyes when pregnant -just that it's best to avoid them in general, and I am sure my mom cringes every time she sees the cakes I've made my kids! :) I will have to look into that a little further. Thank you! I've so enjoyed reading all the comments on this post. Everyones kindness, love, and excitement means so very much to me! God bless you all!! Congratulations. What a blessing for you and your family. Dear jessica, blessings to you and you and your beautiful family. you'll be in my prayers. When I read a post of yours earlier this week, you mentioned you have been tired, and i thought to myself, I wonder if Jessica is pregnant. What wonderful news! So happy to hear about your newest blessing! My family(not Catholic)can't understand how in the world I want lots of children (my husband sent us a 15 passenger van from Iraq, you'd think that'd be a hint we would love to blessed with more children?). I have seen and heard everything from you'll be mentally/physically exhausted, groceries, leaving a huge carbon footprint, you have your hands full, etc. you get the idea. I am sure you probably have heard it all. How do I tell others that kids are a blessing? That, I can handle this? In addition, sometimes I want to say I need help or vent a little frustration I perhaps had that day, but I can't because the response I get is, "You chose to have all those kids (I only have 3) and it's only going to get worse the older they get." Any advice for a fellow mom who is open to life and tired of the comments? Should I even respond? Oops, meant 12 passenger van...it feels like at 15 seater with my 5ft self behind the wheel. Wonderful news! Your family is a wonderful inspiration, and all of you will be in my prayers. Blessings to you and your family Jessica! I pray for you and your "new" little one! I made a little happy yelp when I read your news! Congratulations and many blessings! Congratulations!! How exciting to have two Christmas babies!! You'll have to let us all know how it is with SEVEN!! Prayers for a healthy pregnancy and baby!! God bless. I am so happy for you Jessica! Thought I'd share that I too learned Holy Week of my pregnancy with #5 and we told the children on Easter as well! What a blessing! YOu'll be in my prayers!! Congratulations! I don't know what I read in one of your posts, or maybe it was a generic "we've been so busy latley" but I had my suspicions! :) I pray you and your little one are healthy and well! Oh Wow! I totally missed seeing this post, but then after seeing your post today about being 6 weeks along, I had to backtrack! What wonderful news!!! Congratulations and thank you for continuing to share all of your amazing ideas with all of us! Blessings on your pregnancy! Congratulations!! You are so blessed to be a Mommy of seven!! You will be in my thoughts and prayers!! Maybe could you say a little prayer for me that hubby and I will be blessed with a child too? We will be celebrating four years on June 16th, 2011! By the way,St. Therese is one of my Patron Saints!! Thank you so much! !